Psychic Lunch: So, should I take Emergen-C, then? So, should I take Emergen-C, then? A reader asked me today what my opinion of Emergen-C was, considering that I recommended against supplementing with Airborne to combat colds and flu. Honestly, I enter this analysis with feelings of ambivalence; I've used Emergen-C quite a number of times, and believe that were I to go look, I could probably still find a bunch of packets in our cupboards at home or even my drawers at work. On the other hand, the more I have studied healing and nutrition through consumption of real (organic, local) food, I've also found reason to suspect Emergen-C, too, might not be all that it's cracked up to be. The Vitamin C they use is ascorbic acid, which is by far the most common type of "Vitamin C" that you'll find processed foods and supplements like this. I find it intriguing that in looking up whether ascorbic acid is good for you or not, I eventually came across a site that heavily refers to a book, the Real Truth About Vitamins and Antioxidants, from the Price-Pottenger Nutrition Foundation. 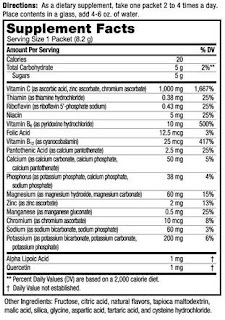 The site, CocoonNutrition.org, confirms my suspicions about Emergen-C. Vitamin-C is needed for all connective tissue, which is what holds up and keeps together all other tissues. It's crucial, and we probably all know that much. However because ascorbic acid is only PART of real Vitamin C, it acts as a histamine, reducing swelling and other symptoms of colds. So, that part sounds pretty good, right? That ascorbic acid works to reduce cold symptoms - slightly - has also been confirmed by many clinical tests. Unfortunately, you're looking at what is actually only a short-term gain. While it may reduce the symptoms of your current cold, your infected tissues remain injured and are more susceptible to later infection. This illustrates the reason why it is important to get your vitamins from natural sources, like organic fruits and vegetables. I am not certain why they have added aspartic acid as an additional ingredient at the bottom of this list, but odds are probably as a flavor-enhancer. Aspartic acid can be derived from natural sources, but - now this is a guess - I would say this type is most likely lab-created. Apartic acid is an excitotoxin like glutamate and should be avoided, because excitotoxins kill nerve cells. Also, in case you're wondering, aspartic acid is not the same as aspartame, but is found in it. It's interesting to note that Vitamins E and C provide excellent defense against free radicals so perhaps teamed with the ascorbic acid, the excitotoxins of the aspartic acid are combatted. However, I will make a personal point of avoiding the latter in the future, so for me seeing its inclusion on the ingredients list is enough to make it a bad choice. If the reason for the inclusion of aspartic acid is as a flavor-enhancer, then Alacer Corp, the creators of Emergen-C, could probably be accused of false advertising. On their FAQ page they state that no MSG is used in their formula, so while this is true, the aspartic acid serves the same purpose and has similar, if not the same, results. There are other suspicious-looking ingredients in the list on the package, but I think I've found enough for me. I hope it's enough to answer my reader's question, which if you hadn't guessed is, "No, I would not recommend Emergen-C." I wish I could recommend it, because its level of convenience is very high. But the ingredients are what tell me "no" I just realized this whole analysis of ascorbic acid is another nail in Airborne's coffin, too. So what can you do? Besides ultimate first step of cutting back on sugar, the obvious of eating foods that are rich in Vitamin-C, you can make your own Vitamin-C powder for extra boosts when you feel you need it. Just buy some organic oranges or other citrus fruit, enjoy the fruit and save the peel. Personally, I'd leave as much of the pith attached to the peel as possible, since I've read that's where most of the nutrients are. Let the peels dry without touching each other, and then grind it up in a coffee grinder. That's it! Fairly simple, and worth the effort. Because, after all, YOU are worth the effort. Excellent! I think I'm going to point a number of friends towards this post in the next day or two. I have always been pretty against Emergen-C just based on the fact that it is so highly processed. I have a jar of powdered acerola berries which is sold as a whole food vitamin C supplement. I add that to tea as my Emergen-C like cold fighting formula. I like peppermint or yogi tea (a warm spice mix), but rose hip tea is really high in vit C as well. Sometimes I just use the powdered acerola, lemon juice and a chunk of ginger to make a hot, healing beverage. A little honey if there's a sore thoat. What about Emergen-C substitutes for the electrolytes? I try to get all my nutrients from foods, but I do sometimes use emergen-c for the electrolytes. I know, I know that you can use coconut water, but dang it, the stuff isn't cheap! and it takes up a lot more space (No way could I store even a 12pack of coconut waters, in my tiny kitchen for the occasional but vital times I supplement electrolytes.) And its a lot of bulk and weight to ship so far. Any advice other than coconut water? I didn't realize just how pervasive ascorbic acid is, either! I went to check my brand of liquid vitamins that I have in the fridge (it's Buried Treasure) and I found that I'm going to have to look for something new. It's got ascorbic acid as well as other poor or synthetic vitamins like cyanocobalamin for B12, and so on. OH - and I'll edit the post to add a comment about the packaging, too - with all the individual packets, it's really not a very green product. Caroline, I do not have an answer for you (other than, yes, coconut water ;) However, I will look into that and put up post about it when I'm done! aspartate is not like glutamate. human brain cells, or neurons, have glutamate receptors which are excitatory, but we do not have aspartate receptors. we do have NMDA receptors which require a methylated version of aspartate but that's not aspartic acid. Aspartate (the conjugate base of aspartic acid) stimulates NMDA receptors, though not as strongly as the amino acid neurotransmitter glutamate does. It serves as an excitatory neurotransmitter in the brain and is an excitotoxin. - Chen, Philip E.; Geballe, Matthew T.; Stansfeld, Phillip J.; Johnston, Alexander R.; Yuan, Hongjie; Jacob, Amanda L.; Snyder, James P.; Traynelis, Stephen F. et al. (2005). "Structural Features of the Glutamate Binding Site in Recombinant NR1/NR2A N-Methyl-D-aspartate Receptors Determined by Site-Directed Mutagenesis and Molecular Modeling". Mol. Pharmacol. 67 (5): 1470–84. doi:10.1124/mol.104.008185. PMID 15703381.